Show your configuration of FVWM !!! hehe thatÂ´s not my desktop. but thatÂ´s pretty much default I guess. however, it's not beauty behind my fvwm config. I wouldn't count my config as very beautiful. I made it, because i wanted unique desktop, that's why i'm still thinking about sharing my config. The best part of my config, is how it feels when you use it. I can't use anything else, now, i'm so used to it, that everything else, just ain't right for me. Ugh. I wish you'd post it . ItsÂ´ interesting to see how many posts for fvwm2, gotta be the most used wm by freebsd users except for terminal perhaps hehe. I would like to script fvwm2 to only have a pager at the bottom thats all, and no borders around it. Anyone got a nice config for that? Okay I will try with the help of google I would also like to know how I can get only 4 squares in the pager instead of 9.
thanx it worked good and I got the pager transparent too. there is a problem though, when I click on a desktop it gets black but when I click on another, the old one statys black. so if I click on them all they are all black. I want them to return to transparent again. I guess there is just some miss in the config I have made. post your config, i'll see if i can help. I wonder how did you made pager to be transparent? It is intended to use with Vertex GTK theme by horst3180 and it uses some of its colors and titlebar buttons images. Menu icons where taken from Vivacious Colors icon theme. 0. Install FVWM # pkg ins x11-wm/fvwm2, if it isn't installed yet. 1. Fetch and install Vertex GTK theme and its dependencies. 2. 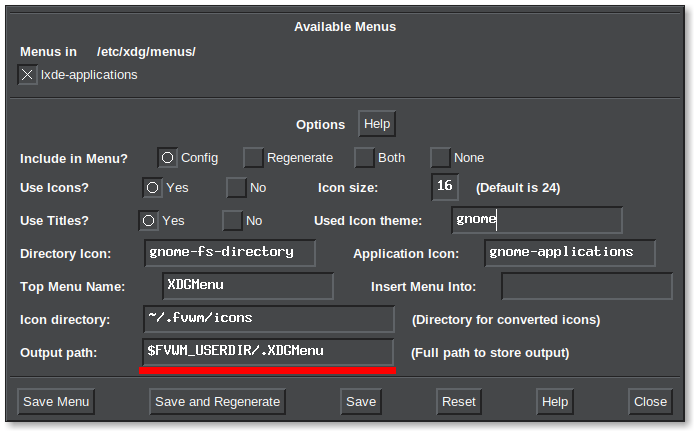 Install x11-themes/lxappearance, launch it and choose Vertex theme. and extract .fvwm dir from archive to your home dir (~/.fvwm). 4. Remove old FVWM configuration (like ~/.fvwm2rc) and launch or restart FVWM. I've submitted bug report with request to update x11-wm/fvwm2 to 2.6.8 and it was updated, so update your ports tree. If you're using FVWM 2.6.8+ version, you should install py36-xdg instead of py27-xdg, because new version uses python3 to generate XDG menu. Also It is good idea to install xscreensaver, then you'll be able to lock the screen using "Options" menu. As a file manager I use x11-fm/pcmanfm. Also it is possible to use this config with GNU/Linux! In Linux also you need to execute # chmod u+s /sbin/shutdown to shutdown or reboot via "Quit..." menu. tick appropriate options (do not change default "Output path"! ), press "Save Menu" (or "Export Menu" if you use FVWM 2.6.8+). your custom .desktop files to ~/.local/share/applications, shortcuts from this dir will be also added to menu. "Edit ..." menu entries from "Options" menu uses $edit environment variable, change it to your favorite editor in ~/.fvwm/config, also it is possible to change default terminal emulator from urxvt to xterm, edit $terminal vatriable. Check ~/.fvwm/config to see full keybindings list. it will restore all applications, that were minimized before and its position (it is possible to use ctrl+alt+d as well). mouse wheel should raise/lower dock. Also it is possible to move applications via pager with middle mouse click. 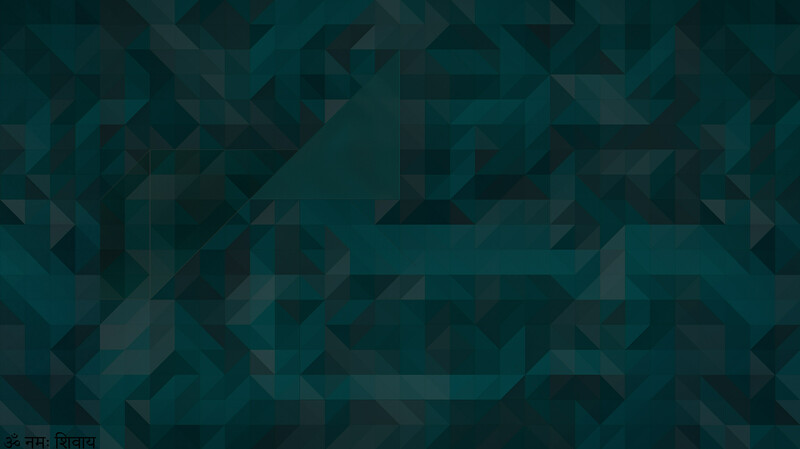 Here is my wallpaper from screenshot, it is a little bit edited wallpaper from gnome-backgrounds-3.18.0. Inscription at the bottom says "ॐ नमः शिवाय". to ~/.gtkrc-2.0 and to ~/.config/gtk-3.0/settings.ini . search for "layout.scrollbar.side" and set it to "3". after installation. To use it outside of WMaker WM, use "--non-wmaker" flag. fvwm! What a blast from the past.... Nice to see some window manager biodiversity. wmmoonclock does something that casuses X to use ~ 5 percent cpu on my skylake system. It also makes compton waste a few more percent so that the system sitting idle has about 10 percent cpu usage. (wmcpu does not work so great, always underestimating compared to top; maybe it is unaware of multiple cores?) I notice this because my system has irritating fan noise even at low speeds. Probably needs a heat sink repaste. pcmanfm says unsupported operation and dumps core when I double click the trash can. I did not install vertex because I like the old fat window borders. Never had any of your issues on several installations. Probably your problem isn't with these applications. for more than a year, never noticed any problems. But also I didn't try to use "skylake system", so maybe it is the problem. if it is already installed, launch x11-fm/pcmanfm from console and try to "google"
x11-fm/pcmanfm is the most stable GUI file manager on FreeBSD. Also, it is very easy to replace any of dockapps in config file, just replace it in ~/.fvwm/config. Oh, devel/gvfs wasn't in the list above..... I don't have it installed. I'll give it a try. I'm using x11-fm/rox-filer but it has some (fixable, with mouse button reassigning in ~/.fvwm/config) problems with fvwm when rox is providing the desktop ("pinboard"). Oh, devel/gvfs wasn't in the list above..... I don't have it installed. It shouldn't be there, also there is no pcmanfm in that list. replaceable, so use anything you want, just replace it in config file. ILUXA, what is the difference between the graphic window managers, FVWM or TWM and IceWM or JWM? Which is the most complicated of configure? what is the difference between the graphic window managers, FVWM or TWM and IceWM or JWM? Which is the most complicated of configure? All those WM you mentioned are dynamic window managers so they all do the same thing, more or less. The hardest to configure and more complex then others WM it's FVWM but this one can be configured in ways which can be limited only by your imagination. It is 4 different WM-s, its configuration is different, design, etc. TWM is very old and outdated, IMO there is no good reason to use it nowadays. so with FVWM you'll never be limited with design or functionality. ......for example, another one WM that is worth to try is Fluxbox. And FVWM is powerful, stable, lightweight and highly customizable WM, it is my personal favorite, with FVWM it is possible to re-create any function from any other WM, so with FVWM you'll never be limited with design or functionality. 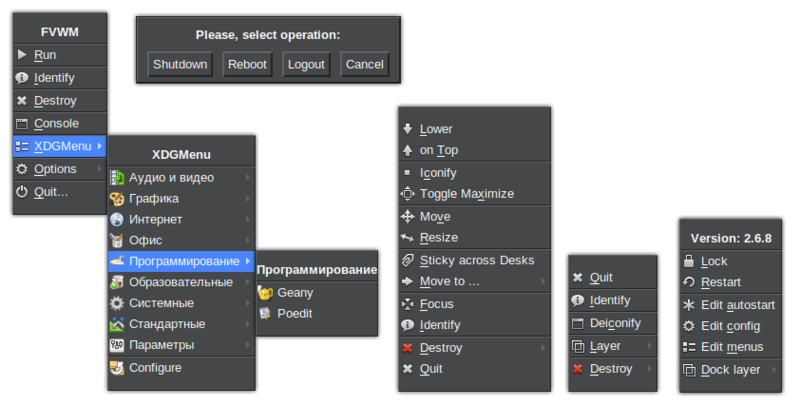 Apparently its graphical manager, it displays excellent configuration, it is quite rudimentary to see the type of icons. I didn't know that FluxBox was WM, the FluxBox window manager is quite complicated, practically everything is written and configured by hand in a text editor, even though it doesn't recognize the guest's video driver in virtualbox-ose-additions. In your window manager, how would you proceed to make the user's window look with a dark style theme? how would you proceed to make the user's window look with a dark style theme? To make windows use dark GTK theme, it is possible to choose dark theme via x11-themes/lxappearance, for example, while if you want to change window decorations color, like title bar color, buttons background color, etc, you should edit configuration file by hand, there is no GUI configuration for FVWM. But it is very easy and very quickly to do so, if you know how things work in FVWM, personally I don't need any graphic configuration utilities for FVWM. Just use % man fvwm and you'll be able to see all FVWM options. it doesn't recognize the guest's video driver in virtualbox-ose-additions. I'm not sure how vbox integration works, but it doesn't depend on your WM for sure. BTW, stop using *nix OS-es only via VirtualBox, install it on your real hardware. but it isn't really possible when using VirtualBox only. Is he angry and only scolding? Due to lack of support or FreeBSD drivers for the real machine, I try to use the system for daily use on the virtual machine. FreeBSD has been a project for 25 years and has not attracted most users because it is very difficult. I don't often ask questions, and I don't understand why they bother with questions that are asked out of ignorance, and you, how many years will it take in the forums and in the free software world? I'm still new, little by little, I'm learning something, because unfortunately, the politics of the powerful have imposed their philosophy with their funds on education, imposing only closed-source windows in the learning in education from a very young age. Don't be amgry and smile at life with the few who try an idea of free software. You can customize themes by copying files from /usr/local/share/fvwm/themes/whateverpart.cfg to ~/.fvwm/themes/personal/ and then selecting the Personal theme (or just parts of it) from the menu.